This is our best recommendation if you really want to see what paragliding (the basis of Paramotoring) is all about. We'll start on the lower slope with the basics, and by the end of the day you'll fly from our 200 foot training hill. Learn how to launch unassisted, turn, approach and land with the greatest of ease! The lesson includes an overview of equipment, controlling the glider on the ground and in the air, flight plans, and a ride back up the hill for your next flight. This Day Lesson includes the use of our state-of-the-art DHV-1 Certified paraglider and harness training equipment. Click HERE for more about why to use Certified Instructors and gliders. The PPG-1 Basic Training will cover the fundamentals of Powered Paragliding. You will learn to inflate the paraglider and balance the kite overhead. We'll cover the terminology, operation and preflight of the motor unit. We will practice the launch sequence on our simulator, and you will experience your first flights in a paraglider. The progress of each student is individual, and advancement towards powered flight and/or certification depends on the student's ability to master the skills necessary. Paramotoring requires more training than regular paragliding, not less. We know that this may run contrary to what you might have read or heard elsewhere, but consider how adding 50-100 lbs of additional weight might feel when trying to kite, launch, fly and land the same paraglider might feel. The characteristics of all these are significantly more difficult, and a pilot must have a good set of basic skills to operate a paramotor safely. The PPG-1 Basic Training is an introduction to powered paragliding, and most students will not become proficient enough in three days to add the motor unit. 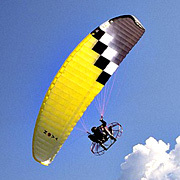 You will also need to purchase your own paramotor before we transition to flights with power. We want each and every pilot to become confident with their skills, so they can fly for the rest of their lives, not the rest of the week! Your relationship with your instructor will help you make the right decisions, from weather observations to equipment purchases. PPG-1 Basic Training includes the use of our state-of-the-art training equipment (unpowered) at our excellent training hill. Master the fundamentals of flight in a powered paraglider or PPG Trike. This course will take a new student from the Basics through USPPA Certification. 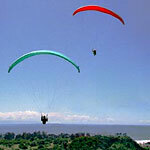 It includes a complete overview of paramotoring and powered paragliding. 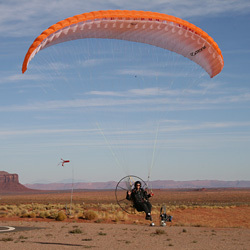 Upon completion of this course, students are ready for extended paramotoring flights with their own powered paraglider. This is the minimum certification level that allows PPG pilots to fly without the direct supervision of an instructor. Understand the paramotor powerpack: assembly, disassembly, preflight, starting, throttle control, power cutoff, fuel/oil mixing, maintenance, torque and thrust effects, special dangers, transporting and storage. Become at ease with both forward and reverse inflations, with smooth transitions to launch. Control the wing through turns and mild turbulence. Begin to understand micro-meteorology and its importance for safe and fun flights. Unlimited hands-on instruction at the training hill and your first powered flights once your equipment has been purchased from us (weather and skill permitting). Earn your United States Powered Paraglider Association (USPPA) Certification or United States Hang Gliding and Paragliding Association (USHPA) Paraglider Novice Certification. Pilots proficient in either PG or PPG can learn the dynamics of 'Crossing Over' to the other style of flying. Expand your horizons today and join us in the air more often! The Tandem Instructor Rating is regarded as the highest rating a pilot can achieve according to American Paragliding and the United States Powered Paragliding Association (USPPA). Flying with a Tandem Instructor is an excellent instructional opportunity for students, and anyone interested in becoming a powered paraglider pilot. Paramotor Tandem Instructor Clinic participants work on technique and theory as they work towards their tandem certification. Enroll with a friend and purchase your new motor/wing packages, and we will come to your place to do the training! All we need is a flat field with no high obstructions and permission to fly! We will come to you and conduct the training. Call to find out more. If we are unable to complete a program due to an operational shutdown, we will pro-rate a refund or merchandise exchange. There are no refunds or exchanges for students who terminate programs. Programs are not transferable to another individual. A surcharge may be applied if a student has missed training for more than 6 weeks. Reservations are required and are not confirmed until a deposit has been paid. Cancelling a reservation must done 72 hours in advance, or the full fee applies. We reserve the right to modify, change, or delete any aspect of the training programs or fees at any time.